(EoF News)-- A legislator from Riau questioned the government who used helicopter facilities from a forestry and plantation company to monitor forest and land fires in the province. “As company’s helicopters were used by the Government to monitor and supervise, then it will make the authority owes [the company’s service]. Consequently, it will be difficult to decide the action and supervision to such a company,” said Noviwaldy Jusman as quoted by Riau Pos on Monday (26/2). Media reports said Riau Disaster Mitigation Agency (BPBD) was using four helicopters to extinguish fires where three of them belong to Sinar Mas, a company affiliated to Asia Pulp & Paper (APP). Noviwaldy said Sunday that a company should secure each concession from any burning that possibly occur. “Besides the government, we also ask law enforcers to firmly probe any burning thoroughly. Both in company’s land or person’s land,” he added . Riau province had set emergency status of forest and land fires starting 19 February following a meeting attended by Riau Province government, military, police, Ministry of Environment and Forestry’s Manggala Agni firebrigades, and BPBD Riau (Disaster Mitigation Agency). 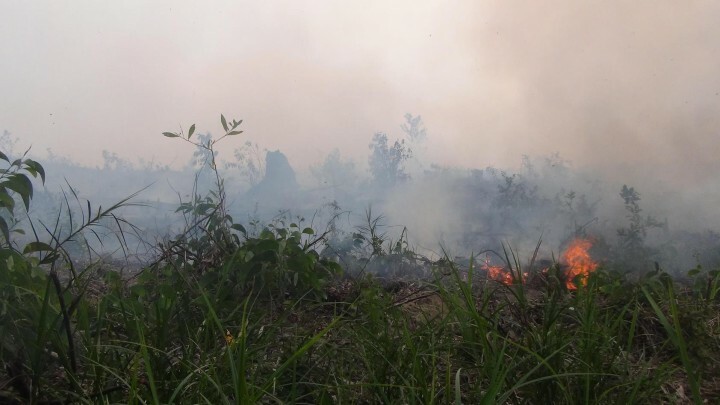 According to BPBD in Riau the forest and land fires had razed 735.5 hectares since January in the province where Meranti Island was the largest area burnt with 213 hectares and followed by Indragiri Hulu (121 hectares). Then they are followed by Dumai city (109 hectares), Bengkalis (100), Siak (59), Pelalawan (31), Pekanbaru (31), Rohil (26), Indragiri Hilir (24), Kampar (15) and Rokan Hulu (1). In some areas, the burnings still occur such as in Rupat island, Tebing Tinggi, and Sungai Apit. Head of BPBD Riau Edwar Sanger told media that the task force urgently need helicopters to extinguish fires by water bombing (Tribunnews, 27/2/2018) as the agency only use them for monitoring mission. A police’s spokesperson said that area of PT SRL (Sumatera Riang Lestari, an APRIL’s supplier in Rangsang island) and PT National Sago Prima (sago’s supplier of Sampoerna Group) were razed by fires last week. ‘’Besides land of PT NSP’s and community’s, meanwhile PT SRL’s one were also burned,” said Guntur Aryo Tejo, Riau Police’s Spokesperson last week. The police are probing the burnings in both concessions in Meranti Island district. Taufikurrahman, legislator from Gerindra party, urged the police to investigate fires occurred in PT SRL and PT NSP as the companies were obliged to prevent their concession and surrounding from any burning. “If there is indication of ignorance [by companies], this contains criminal motive,” he said (Riau Pos 26 Feb 2018). Woro Supartinah, coordinator of Jikalahari, said the Riau Government should prioritize to implement actions plans to prevent and mitigate forest fires. She said last week that protection by policy should be conducted in burning prone-areas and implement concession’s evaluation. Jikalahari also urged the Riau government to supervise the concessions holders and empower community to mitigate fires that all covered in Riau Governor Regulation number 5 year 2015.